Last post, I said that I wasn’t going to go into how I came to pick The Neverland back up and start working on it again, and in truth, it’s partly because I don’t remember exactly what gave me that final nudge to open up the Notes file on my iPod and start writing. I think it was a combination of different things, one of which was discovering this book. As you can see, the most recent activity is a retweet from Jonathan Wenzel about his Peter Pan novel. At the time of tweeting it was only available for preorder, but now you can buy it directly from the US Amazon. Curious, I clicked on Wenzel’s website and started reading about his novel, which is a telling of the origin story of Peter Pan. So I knew I was dealing with a likeminded soul here. (I know it’s not explicitly stated that he was referring to Peter and the Starcatchers, but it was a pretty good bet, and I confirmed via a comment on the video which Wenzel replied to that he was indeed talking about that novel). After watching the rest of the video and reading through the book’s reviews on Amazon, I decided to buy myself a copy. (I was originally going to ask for it for Christmas, but screw waiting). I read it on and off throughout December and finished it last night; it’s not the type of book that compels you to devour it as quickly as humanly possible, but it was a very good read. It took me a couple of chapters to get used to the author’s style, and as with all self-published novels, there are some spelling errors and missing words scattered about. But those are really my biggest criticisms. With Peter: A Tale From Neverland Wenzel creates a complex and fully-realised Neverland complete with detailed depictions of the creatures who live there and their unique cultures. The novel’s historical (and geographical) setting is ambiguous, but that doesn’t detract from the story being told. And while you know from the start that Peter has to survive the novel, Wenzel finds other ways to raise the stakes and create a sense of risk. There are some clever little details sown through the story which are important to the novel’s endgame, and while I could tell that they were significant, I didn’t manage to guess just how they would be brought back into play. 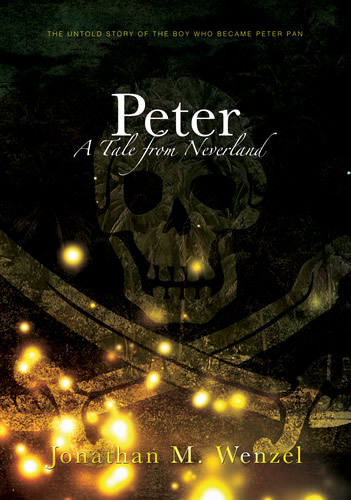 I do find Peter: A Tale From Neverland to be a more convincing origin story for Peter Pan than Peter and the Starcatchers, and I think a lot of that is because Wenzel understands that not everything needs an explanation. The island that is Neverland and its inhabitants just exist, and there isn’t any need to explain how or why. Peter and the Starcatchers attempted to systematically tick off every aspect of the Peter Pan world and explain how it came into being, but the more you try to rationalise things, the more attention you draw to how unnatural they are, and the less convincing they become. With that said, though, I don’t accept A Tale From Neverland as Peter Pan’s origin story. Part of the problem is that Peter Pan does have an origin story, and as unlikely as it may sound (in Peter and Wendy, Peter tells Wendy that he “ran away the day he was born” and “lived a long long time among the fairies” in Kensington Gardens), it fits with the way Peter is written and the world that Barrie created. Peter Pan in the original canon is a slightly surreal figure, not quite human, and to give him a human origin – even if fantastical things happen to him along the way – defeats the object of who he is. But that doesn’t mean I can’t enjoy the heck out of a story which imagines a human origin for him, and Jon Wenzel’s creation is a very enjoyable one. I gave it a 9/10 in my “book of books” (a notebook in which I record each book I’ve finished, the date, author and what I thought of it, including marks out of ten) and I highly recommend it to anyone who is looking for something new to read, particularly if you like fantasy, history or are a fan of Peter Pan. (Click the image at the top of this post to go to the book’s page on Amazon). Also, Wenzel has confirmed that there will be follow-ups to A Tale From Neverland, and I am very excited to read those whenever they are published! Normally at this point I would begin a long spiel telling you how I never meant to let The Neverland drop but ~things got in the way~, and then explain in great detail what those things were and how crazy it all was, and then what inspired me to pick the project back up and begin working on it again. But that’s pretty boring for you to read and it’s not that interesting for me to write either. So to cut a very long story short, a few weeks ago I started working on The Neverland again, starting with some notes which I wrote on my iPod, which snowballed into plot development, character ideas and filling in some holes which have been plaguing me ever since I first attempted this story for NaNoWriMo over three years ago. (God, it’s been a while). I’ve sorted out what happens in the climax of the story, which has been my biggest persistent issue with the plot. It employs some very handwave-y computer science and I’ll probably improve on it as I come to write that part, but I’m happy with the basic idea and it ticks all the boxes of what I wanted to do with the plot climax. I’ve written up a detailed plot outline to replace all the scattered and conflicting notes that formed my outline before. (Going back over all my notes with fresh eyes also made me realise what a mess they all were – and how many little details had got lost or been changed over the course of writing the story). I’ve also managed to tighten up the pacing, particularly towards the end. (Leave it to me to mess that up the minute I start writing, though). I’ve added to my Character Arc notes for Peter and Wendy and also written a character arc for Tinkerbell and part of one for Tiger Lily. I still have a lot of work to do in terms of developing the story’s side characters. I’ve drafted part of the “Saving Tinkerbell” scene, one of the climactic scenes of the novel. It’s only a few hundred words so far, but it’s good to get my ideas down for me to come back to and expand on later. I’ve broken down the plot into a series of conflicts, which has really helped me to sort out the key elements driving each stage of the narrative and not lose sight of where the story is meant to be going at each point. Lots of progress! In general I think that coming back to the story after a break has helped improve my focus, and I’ve been able to determine which bits are just cluttering up the narrative and get rid of them to tell a cleaner and more coherent story. That’s one of the things that is hard to do during NaNo; the goal is just GET TO 50,000 BY WHATEVER MEANS, so you throw everything and the kitchen sink at your story to pad it out, but not much of that makes for a good end result. After re-reading Peter and Wendy, I think I have a better idea of how the middle of the story is going to go. I was always pretty sure about how it would start and end, but the middle has always been sort of up for grabs. Unfortunately, I have no idea what I was referring to or whether the idea I’d had for the middle of the story has survived in the current version. Hopefully it has! So, what next for The Neverland? I’m happy with the level of plot planning I’ve reached over the past few weeks. There’s still a lot I can do in terms of character development and research, but I think it’s time to take the plunge and start (re)drafting the story; I can figure out the rest of it as I go along. I have a specific plan for writing the story which I will reveal in another post in a few days’ time. Also, look out the day after tomorrow for my first Recommendation Tuesday of the revived blog! Author’s Notes: I was looking back through my post history for the blog and realised how long it’s been since I posted actual story content. I admit I haven’t written anything new for some time, but months ago I wrote a prose piece about Peter’s backstory from his mother’s perspective that I’d planned to post on the blog. However, I showed it to a friend whom I’d hoped would help me edit it, and the problems that she pointed out were so intrinsic that I despaired of ever being able to fix them short of totally rewriting the whole thing. So I put it away and didn’t look at it. Or, ‘On Making Rough Drafts Public’. Originally I was going to have this Friday’s post be about The Evolution of Setting, but I couldn’t remember half the points I wanted to cover, and I decided that I should probably save most of these backward-looking posts for when I’ve actually, y’know, finished a first draft or something similarly outlandish. So instead I’m going to talk about an important consideration for any writer who wants to build up a following online: namely, how polished does my writing have to be before I post it on the Internet? This is one of those Tuesdays I mentioned where I will recommend something that's not-so-directly linked to The Neverland as a project, but has themes and subject matter in common. Is it still awesome? Oh yes. If you're an Internet user, you may well have heard of The Pirate Bay, one of the biggest and most notorious sites for pirated downloads. But have you heard of the documentary that tells the story of the users behind The Pirate Bay, their beliefs about freedom of information which led them to create the site, and their recent court battle against the Swedish government?